I have stretched the boundary of this ”travel blog” many times before – and I’m about to do it again. I’ve always advocated that blog’s are at their best when they are up close and personal – and whilst I have shared the death of my mother, blogged whilst depressed or scared and under fire in Iraq and even Tweeted my wedding – there is somewhere I haven’t gone yet. You may or may not know that I am an artist. I wear the label like an alcoholic wears Johnnie Walker (hidden in the drawer or tucked into an inside pocket) . I was born with the affliction (it was a genetic disorder handed down from my grandfather via my mother), and whilst it does on occasion cause joy, in the main it is more akin to a frantic compulsive obsessive disorder. It is only by associating my creativity with healing, provision of comfort for others or political meaning that I have felt comfortable even talking about it. Usually I feel self indulgent and a bit mentally ill when the passion to create takes over. Hence I barely talk about it. At least not in any depth. Last year I was turned down for an Arts Council grant – largely because I presented my proposal as a community cohesion project and neglected any reference to my own artistic development. They must have viewed me as someone trying to meet a cold political aim with technical application of my skills. I said nothing about myself. The project may have been about tolerance and diversity, but it said little about what I, as a living breathing artist could contribute or about my mental approach to my craft. Perhaps because, like a drug addict, I am loath to admit I am a “user” (of the paint brush). My creativity does relate to my travels – so perhaps safe to talk about it on my anonymous travel blog. In the 36 countries I have visited, I have painted or sketched in every one of them. A nomadic closet-artist. On occasion I have exhibited my work – the British Council kindly sponsored a solo show of my self-indulgence in Slovakia in the 1990s. And my beloved Sri Lanka has been host to more than one of my exhibitions (along with other “users”). I’m getting used to the whole humiliating ritual of painting in private and then hanging things on the wall for friends and strangers to look it. It feels very “show offy” and I liken it to an AA session. My name is Nomadic and I’m an artist. So here is the bit that I missed out of the Arts Council proposal. A few weeks ago I was approached by a retired ballet dancer and asked if I could paint his portrait. He asked me about the process – what was involved. I’m not used to sharing this, but once I started talking you couldn’t shut me upnd I realised I had a need to share. If I paint a portrait of someone I don’t ask them to sit in a pose for hours as I stand pompously before them with my canvas, stroking my chin and squinting at the subject. Rather I spend time with the subject, watching how they move, how they talk, what makes them laugh, sometimes witnessing uneasiness, sensing flaws, and understanding what moves them, what makes them tick. I listen. I look. I may record the encounter with a couple of sketches and photographs, but this is more of a record to jog the memory of the empathy and intimacy discovered. Then I return to my studio (a room at the back of my garage with paint spattered cheap carpet and the faint odour of nicotine from smoking times past). I will probably do a fair amount of thinking and “sleeping on it” before I begin. I usually begin with a basic layout plan, although this may change. I alternate between sessions using a thick pallet knife, a broad brush, a fine brush and sometimes fingers. I rub paint onto canvas, scratch into it, or daub it. 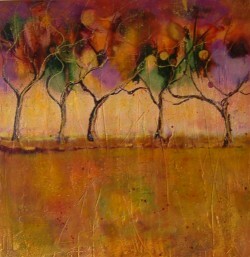 The wonderful thing about oils is the freedom to move it around the canvas – it’s fluidity. I use fine washes and I use thick blobs. Some paintings will take months to complete, and each session of work will have a different mood, a different feeling, another layer. My work is very much about the process and the emotion involved. By the time I am nearing the end, I have very much fallen in love with the subject. I feel I “know” them better almost than they know themselves. This is the creepy, stalker-bit, which I usually keep covered. It’s not a sexually or needy love – but a love of that person as a human-being. So yes, it’s true to say I love Derrick Ashong, Lord Ahmed of Rotherham and even John Humphrys although I have never told them so. After my mum died it was a good few months before I could contemplate creating portraiture and I turned to nature and began looking at trees and all things growing. I felt completely “in tune” and empathetic to my environment – as I believe extreme stress and mental disturbance can generate. I found pretty quickly that the process of expressing this feeling on canvas was pretty similar to when I painted a portrait. I began to fall in love with the apple tree in my garden, with the grass growing and my son’s potato plants (even though we planted them too close together). I’m not sure what to do with this love but channel it through art and for the first time, talk about it here. The power of it scares the hell out of me – but it is very passive. 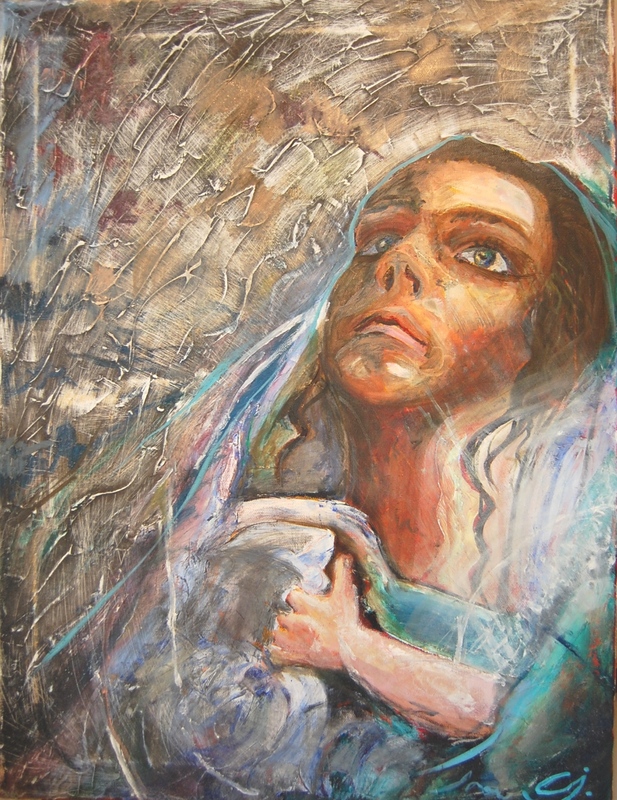 At most I may shed a tear as I paint (a recent painting of Mary/Maryam mother of Jesus/Isa generated many of those, for she is in everywoman and I am she). You probably find it very odd that this passion (or “Junoon” as a new friend would call it) is more difficult to write about than the loss of someone close, romantic love of my husband, or my own mortality. These things I write about, usually because I know that other people share this. I know that by sharing my own grief, love and fears that I will be providing comfort to others. But by sharing the intense-up-closeness-generated in the act of painting I feel I am stating my difference. What marks me out from others. I may appear a bold individual soul, but inside I really do just want to be like everyone else. I anticipate readers will mutter “huh….that’s wierd” or “bit creepy, I hope the freak doesn’t want to paint my portrait”, but I hope, just maybe, that there is someone else out there who shares this spiritual high. Someone who gets what on earth I am talking about. Who can weep with joy and understanding at a tree, or a face or the wind. So, Arts Council, yes it is about the process. The meaning. The feeling. The insanity. The high. Don’t expect me to be putting into a turgid funding application any time soon though. This boundary stretching travel blog will be back on course after a short interlude of non-travel. A few weeks should do it. It goes against the grain – sharing this with you. I am not sure what drives artists and writers to share their creation with others. It makes me uncomfortable even. Painting, blogging, writing, communicating – can feel self obsessive, indulgent, and arrogant. But there. Us creatives are caught up in this cruel net of intense sensitivity combined with a bizarre desire to present ourselves – exposing our raw vulnerability. Since my mother’s sudden death on 23rd February I have been painting the picture above. Shivering, smoking too many Marlborough Lights in my tiny makeshift studio at the back of my garage. Dipping my brush into my green tea instead of my accelerating medium – I have painted with more energy and meaning than ever before. 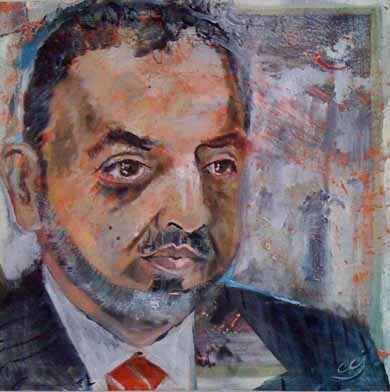 The portrait of Atwar Bahjat (herself lost to this world on 22 February) has kept me company in my state (seen peeking behind the picture above). What goes against the grain, is that I am sharing this painting with you unfinished (fellow artists will know this pain). Like the vital life of my mother – there is a sense of there being much more to do yet. Aspiration. Potential. Incompleteness. But today, 40 years since my mum gave birth to me – I share this with you. 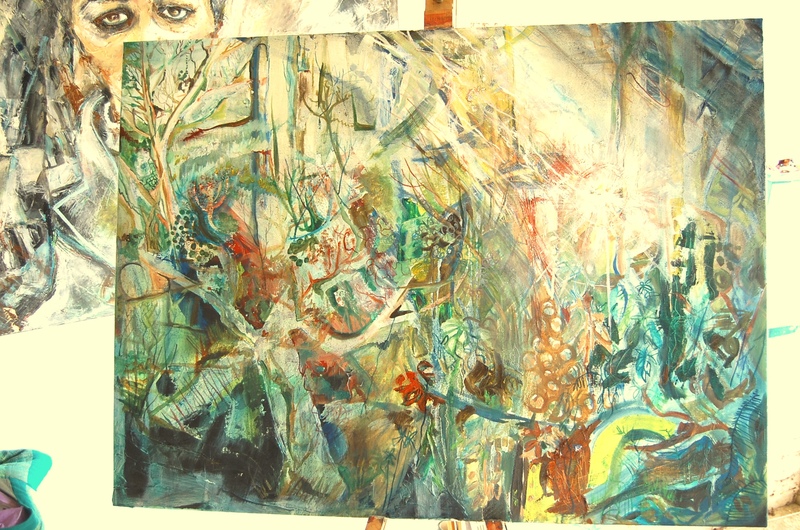 The painting I have started begins to describe how I feel my mum’s spirit left her to unite with nature around her. Over the past few weeks I have felt the love and support of so many. Those at my side on a daily basis, renewed contact from those afar, and the moving sentiment from strangers. My virtual blogging friends told me to “just write” whatever comes to mind, whatever you can – so this blog posting, like the painting has been in the making since the end of February. The delete key has been my friend and my enemy as I have lost many a word in my daily re-edit of this text. But as with everything – I guess this remains unfinished. And in the days directly after her death: “…it makes you question who you are, why you do what you do and it lures you into unusual, testing behaviour and thought like some unhinged life coach”. I find it utterly uncanny that three days before my mother was killed in a car crash I posted about the insight into life that I had gained from a “safe driving” course I had attended. I know she read it. I know she wasn’t going too fast. And I also know that my slowing down and inward look has hastened (if it is possible to speed up decelerating then I’m the one to do it). I managed to squeeze out a tribute to my mum to be read out at her funeral – but it’s a nasty trick to play on a writer – to ask them to carry out this, the most precious of tasks at a time of utter turmoil. I have pasted it at the end of this posting for those that knew my mum that have requested sight of these written words and maybe for those that didn’t know her. So I end with another image (I have a feeling my blog postings may become more visual as time goes on). My mum was a great artist but I was honoured when her art tutor gave to me two paintings she had barely begun. They sit on top of my book shelves between two of my paintings of Sri Lanka (where we had many good times together). In a strange way one of my most treasured of her creations. The Great Unfinished Work. “It’s hard not to feel desperately sad about what has happened. But today we celebrate Marguerite’s life by remembering some of the good things about her time with us. And we don’t have to look far. Marguerite’s mother, Olive, could not isolate a SINGLE memory. No one moment stood out as being special – because as she said “I ONLY HAVE happy memories”. We didn’t just GLIMPSE humour, compassion, sensitivity and love with Marguerite – it was ALWAYS there. A constant. Everyone is this room will have shared smiles, and been touched by her serenity and generosity – she was there as support to many of us, not just by listening, but with gestures – a card, an email or text, or a thoughtful gift (she always seemed to get that right). She was a best friend to so many of us (Caroline says she was “far more than simply a mother to me”). Marguerite left a strong legacy: the creativity that surrounds Dudley every day; Caroline, the daughter she was so proud of (who inherited Marguerite’s artistic gift); and three exceptional grandchildren – Daisy, Billy and Vincent, who think Grandma was the coolest grandma ever (what other grandma could would give a Fatface hoodie for Christmas?) And of course a legacy of many, many friends who have been inspired by her; anyone who knew Marguerite, knew her as a friend and she had a unique way of making everyone feel special. But perhaps her greatest legacy is in her art (which in many ways was inherited from her own parents – her father, Bernard, was a master oil painter of landscapes and, in particular, of trees). Marguerite started her working life as a fashion artist in London in the swinging sixties – and her sense of style never left her. Her attention to how she looked was never superficial – it was careful, delicate, colourful and harmonious. By the 1970s, she was decorating and designing furniture hand-made by Dudley. But over the past decade she dedicated her creativity to canvas, and in the paintings she leaves behind we know that every brush stroke (or tooth brush stroke!) was delighted in and enjoyed. It was the process of painting that she loved as much as the final product. Her style has been described as “hauntingly beautiful,” a description perhaps that could be attributed to Marguerite herself. You may have read this most unusual press report of the traffic accident – “There is always a sense of playfulness in her compositions – lines dance, interact and separate across the surface evoking energy and vitality”. She even managed to impress her colour on an otherwise tragic news item. And Marguerite had a thirst for learning more and perfecting her craft. She studied History of Art with the Open University and never stopped attending classes in life drawing, felt-making, portraiture, enamelling and painting – exhibiting regularly in galleries in the Bristol area. She also had a love of the written word – and of sharing the written word – she often arrived to stay with Caroline bearing a bag full of recommended reads. In her working life she surrounded herself with books – at the Cheltenham Road Library, Bristol University and the legal library at Burgess Salmon. A few years ago Marguerite moved to Pilton. If Dudley was her soulmate, then Wenlock Edge was her Soul-place. With a tranquil place to paint and some inspiring views you might imagine she would settle down to life at a slower pace – but instead she employed energy and vitality like never before; together with Dudley, she threw herself into transforming her home and garden with the gentle loveliness she was so good at. She continued with art classes, tried yoga at the village hall, explored the area – and even took in the Glastonbury festival, where she could have been found dancing with her hands in the air to the Wombats at the main stage. If you understand Marguerite’s way of creating you will understand her love of the natural world around her. And “world” is right – she drew inspiration from her time in Sri Lanka and even the Maldives – as much as she did from experiences in France and Italy and the physical world close to home. 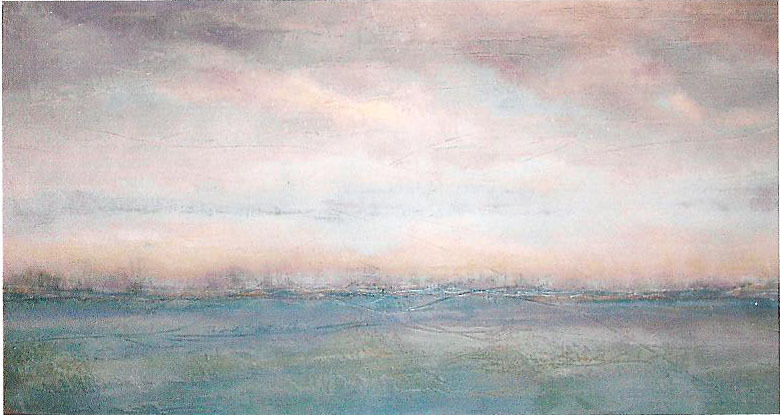 This was expressed not just through her paintings, but in how she lived her life. Her love of animals and nature guided her. Whether playing on the beach with her brother Tony (and Sherry the dog) on family holidays in Cornwall, or giggling as she climbed up Glastonbury Tor, she was never far from nature. It wasn’t so much awe as inspiration – drawn from everything that grows, everything that lived around her; her garden was phenomenal. From a silver birch tree, to the love of a good cat – she had room for us all. “And in a picture I want to say something comforting. I want to paint men and women with that something of the eternal which the halo used to symbolize, and which we seek to convey by the actual radiance and vibration of our colouring. So I am always between two currents of thought, first the material difficulties, turning round and round to make a living; and second the study of colour. I am always in hope of making a discovery there, to express the love of two lovers by the wedding of two complementary colours, their mingling and their opposition, the mysterious vibration of kindred tones. To express the thought of a brow by the radiance of a light tone against a sombre background. To express hope by some star, the eagerness of a soul by a sunset radiance. An extract from a letter written by Vincent Van Gogh to his brother Theo – read out at the funeral service of Marguerite Clapp on 5 March 2010 by her grand-daughter. I thoroughly intend to let both artists guide me from this point on.